Traditionally, reference counting memory mechanisms, such as that used previously by PHP, fail to address circular reference memory leaks; however, as of 5.3.0, PHP implements the synchronous algorithm from the » Concurrent Cycle Collection in Reference Counted Systems paper which addresses that issue. Besides changing the zend.enable_gc configuration setting, it is also possible to turn the garbage collecting mechanism on and off by calling gc_enable() or gc_disable() respectively. Calling those functions has the same effect as turning on or off the mechanism with the configuration setting. 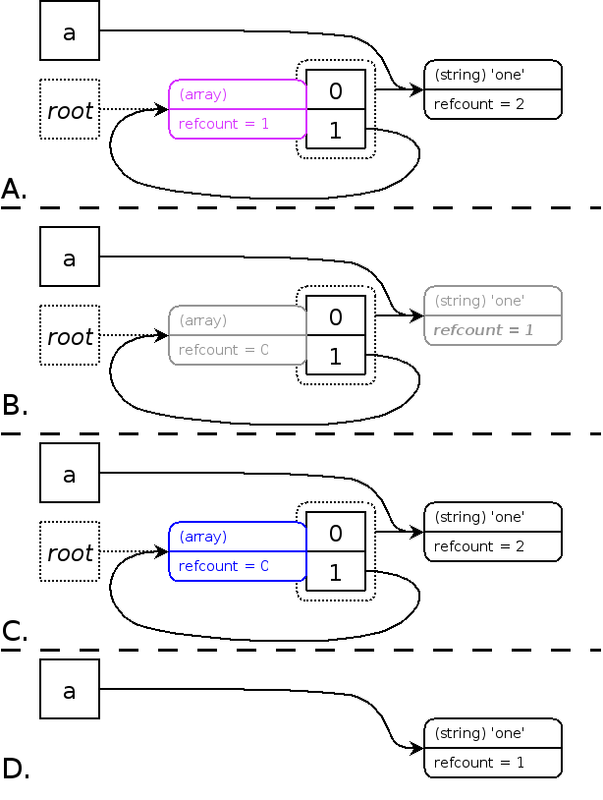 It is also possible to force the collection of cycles even if the possible root buffer is not full yet. For this, you can use the gc_collect_cycles() function. This function will return how many cycles were collected by the algorithm. The rationale behind the ability to turn the mechanism on and off, and to initiate cycle collection yourself, is that some parts of your application could be highly time-sensitive. In those cases, you might not want the garbage collection mechanism to kick in. Of course, by turning off the garbage collection for certain parts of your application, you do risk creating memory leaks because some possible roots might not fit into the limited root buffer. Therefore, it is probably wise to call gc_collect_cycles() just before you call gc_disable() to free up the memory that could be lost through possible roots that are already recorded in the root buffer. This then leaves an empty buffer so that there is more space for storing possible roots while the cycle collecting mechanism is turned off. Memory leak: meaning you keep a reference to it thus preventing the GC from collecting it. After testing, breaking up memory intensive code into a separate function allows the garbage collection to work.